Finally, FINALLY got a Mego Lizard to battle my Spider-Man. He has a dirty and flimsy but original lab coat complete with Mego label. All I have to do now is figure out how to clean and iron it safely. Lizard is one I always wanted for a lot of reasons. His awesome alligator-man head (which is rubbery, so you can make him gnash his teeth together in a threatening manner), his cool colorscheme, and the fact that he has unique details to the line: scaly hands and feet, and a plush tail. The green dolls were notorious for having brittle knee and elbow pins, but this one’s joints are in great shape and (hopefully) show no sign of breaking anytime soon. I’m tempted to leave the coat dirty to reflect that he’s an animal who lives in the sewers. Would be nice to iron and clean it without damaging the fabric, which already looks pretty delicate from age. 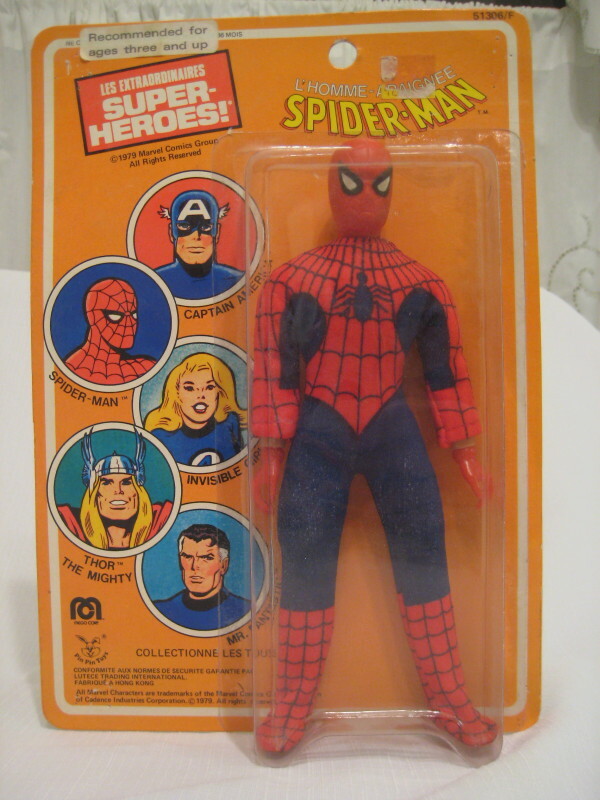 French Mego Spidey, my first purchase as an official collector for a whoppin’ $16. Mego made these dolls in the late 60’s and early 70’s; they’re a favorite item among many toy collectors, and for a while I’d wanted to collect them myself…’til I realized the price range for the average doll on ebay, that is. His leg broke recently, and he’s currently still in the emergency ward until I can replace the broken knee pin, or get a pristine new leg to match the rest of him. He’s in great condition, and my first Mego, so he’s getting no less than the best treatment.